In 2015 HYT launched a radically new look to their liquid display watches in the form of the H3, with a linear time indicator using two bellow mechanisms located on in the top right and left corners of the case. The bellows, present in earlier HYT watches, are again the means by which the liquid was moved through the capillary, a tiny tube of a mere 1mm in diametre. This capillary is filled with two types of liquid, one coloured and water-based, whilst the other is translucent and is viscous. Together with rotating cubes, they indicate the time in a retrograde fashion. Each of the six cubes has four faces, which flip every six-hour period to display the hour component of the time. The minutes are also displayed in a linear form, with ten second intervals from zero to sixty. The minutes retrograde has an articulated arm that acts as a pointer and snaps back to the beginning when required. 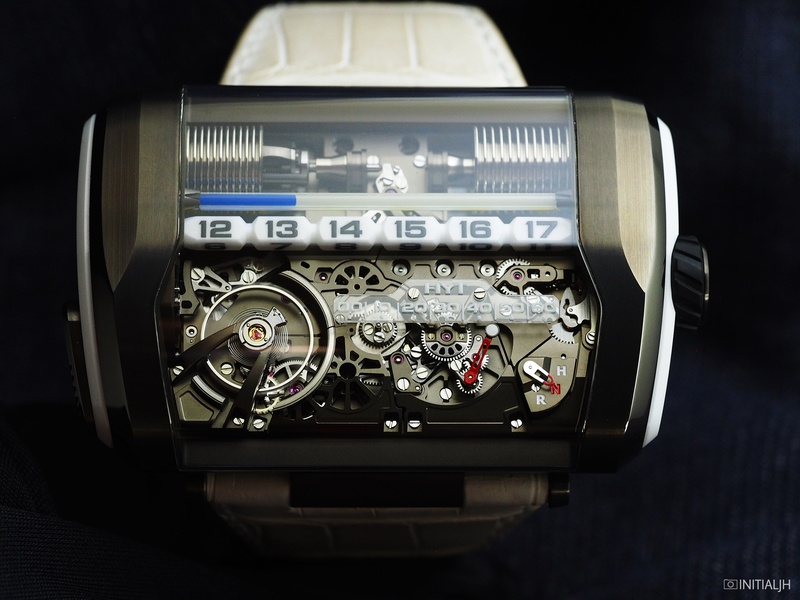 The geniuses behind the H3 movement are Renaud & Papi, who have worked with HYT before. This manual wind movement has a 7 day power reserve thanks to double barrels, and beats at 21,600 VPH. The first H3 was in a titanium and platinum case, but the movement used in it is the same movement even material-wise, as the movement in the H3 Iceberg of today’s post. This special movement create for HYT has micro-blasted charcoal grey PVD-coated titanium bridges with satin-finished accents, and the bellows are rhodium-plated. A power reserve indicator is visible at back. The Iceberg ‘look’ may be familiar to man already (click here). In this H3 manifestation it has a charcoal grey PVD-coated titanium, white platinum and ceramic case, with the rotating hour cubes also in white ceramic, and the liquid in the familiar ice blue. For those unfamiliar with the H3 case, yes it’s as big as it looks, with a length of 62mm, width of 41mm and height of 16mm. The screw down crown also has a crown position indicator (H-N-R) on the dial. ‘H’ is ‘hour, ‘N’ is ‘neutral’ and ‘R’, ‘rewind’. On the left side of the case is a push button to adjust the hour. If you’re interested, click on this link to read the very user-friendly user manual. Is it expensive? At 280,000 CHF? Yes. Is it cool? Yes, and in an Iceberg form, I think even more so.